Whoo goes there? A curious reader? Well then, welcome to the newest edition of Wildlife Rambles, where a different plant or animal on Salem’s campus is featured each month. 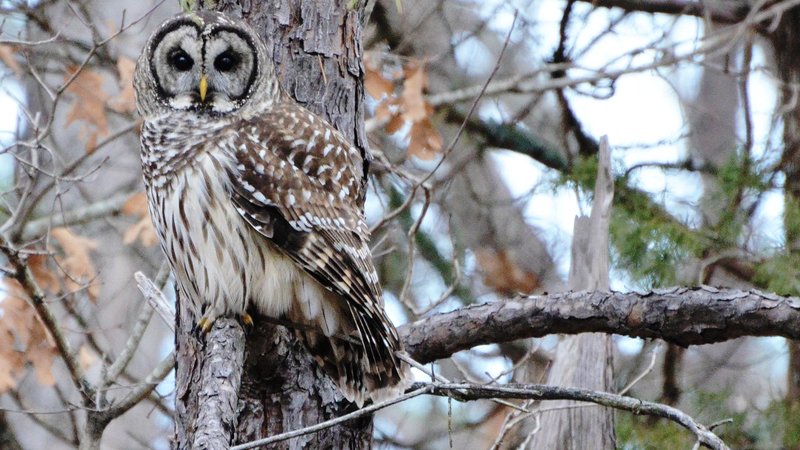 Some of you hopefully caught a glimpse of this issue’s subject – the Barred Owl – this past Fall semester as it perched amongst the trees in the middle of campus. Known as Strix varia, this shy raptor is identified by its rounded head, brown eyes, yellow bill, and brown and white striped and mottled plumage. Though not the largest owl native to this area, the Barred Owl’s wingspan can reach between three and four feet! It uses its powerful wings to soar and swoop silently and capture its prey with its sharp talons. The Great Horned Owl is the most serious predatory threat to the Barred Owl, while the Barred Owl in turn threatens territories of the smaller and less aggressive Spotted Owl. Barred owls are territorial and do not range widely unless food scarcity causes them to move in search of prey – namely small mammals and rabbits, birds up to the size of grouse, amphibians, and some reptiles. The Barred Owl’s diet helps to keep the population of crop-damaging rodents under control in rural areas. According to the Cornell Lab of Ornithology, though Barred Owls do most of their hunting right after sunset and during the night; sometimes they feed during the day. The Barred Owl swallows small prey whole and large prey in pieces, eating the head first and then the body, and will sometimes store their prey to eat later. They do not migrate, and will stay in one area with life-mates for the duration of their lives if not disturbed. The U.S. Geological Survey recorded the oldest Barred Owl at approximately 24 years and 1 month old. It was banded in Minnesota in 1986, and found dead, entangled in fishing gear, in the same state in 2010. The Barred Owl’s typical call is phoneticized as “Who cooks for you? Who cooks for you all?” and in breeding season will create a distinctive, raucous, caterwauling duet that is said to sound like maniacal laughter. Try calling to it yourself, and maybe you will be lucky enough to hear the unique sound of this fantastic bird!